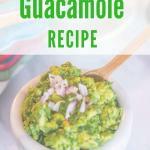 This Easy Guacamole Recipe is simple and delicious. It can go on anything from Fajitas to salads! 1 Make this easy guacamole recipe to go with these delicious sheet pan steak fajitas! Make this easy guacamole recipe to go with these delicious sheet pan steak fajitas! I grew up in Southern California, practically on the border of Mexico. All of my school friends were from Mexico, I spoke Spanish, and can you guess what kind of food I grew up eating? If you guessed Mexican food, then you’re right! Since I grew up eating the authentic stuff, I’m pretty picky about what people label “authentic Mexican food” and get pretty annoyed if I see avocados being blended together with sour cream and called guacamole (please, never do this)! I’ve been mixing my own guacamole since I was a little girl and could probably do it in my sleep. I hardly ever measure my ingredients, but for your sake, I decided to take my time and do a little recipe testing. 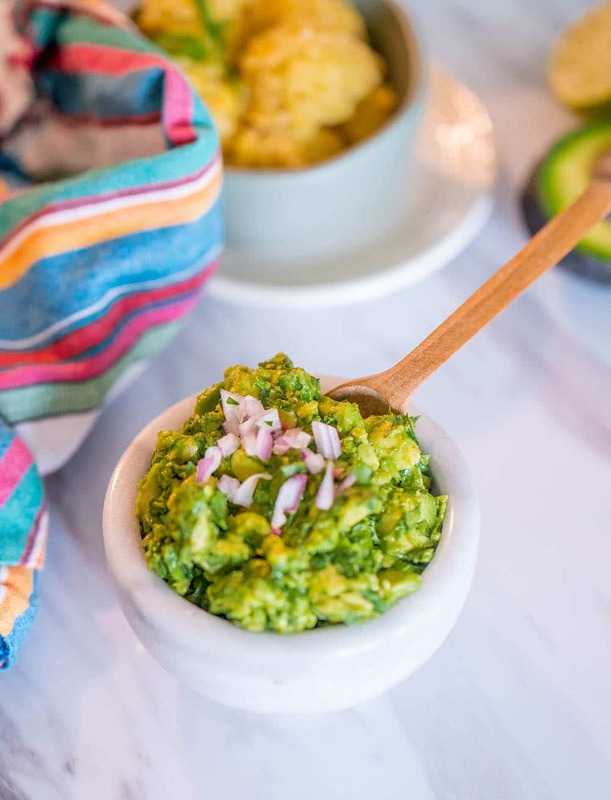 This easy guacamole recipe will be your new go-to guacamole and you’ll never have to buy those mixes from the store ever again! Some might call this a chipotle guacamole recipe because there is chipotle chili powder in it. I LOVE anything chipotle, but I know it’s a personal preference. I don’t add much in this recipe, so if you’re a fangirl like me, feel free to sprinkle away, and if not, just omit it. This easy guacamole recipe is really forgiving, as most easy recipes are, so if you don’t have something, don’t sweat it! Check the color: Most grocery store varieties will be Haas Avocados. Look for dark green, nearly black avocados first. Squeeze your avocado: Give your avocado a gentle squeeze. A perfectly ripe avocado should have a little give and not feel like a rock, but should not be squishy like a hacky sack. 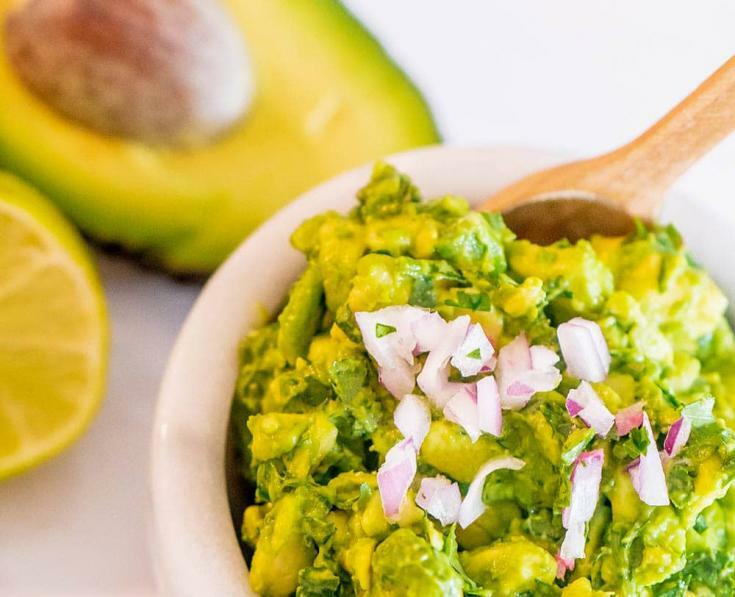 Even though you are mashing your avocados to make guacamole, you still want firm avocados. Check the stem: Peel off the stem cap from the avocado, if underneath is green, you’re good to go, if it’s brown, your avocado is overripe. Now that you know how to pick a good avocado, you’re all set to make your guacamole. The other ingredients should be easy to find. I generally tend to leave out the onions and the jalapenos from this recipe because 1. I just can’t do uncooked onions (thank me later) and 2. my kids are wimps when it comes to spice, so they’re not jalapeno fans. 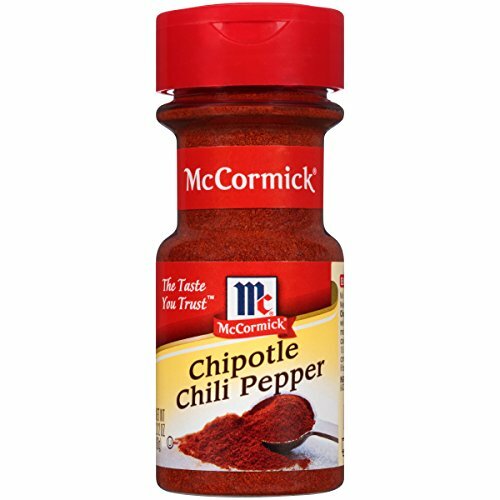 I feel like the chipotle powder gives it just enough kick and spice without making it too spicy. Sometimes finding chipotle chili pepper can be a challenge. You can always buy it here. If you’re looking for something to put this guacamole on (I mean really you could eat it straight, it’s that good), try these amazing one pan steak fajitas! I make these at least once a week and they are AMAZING! 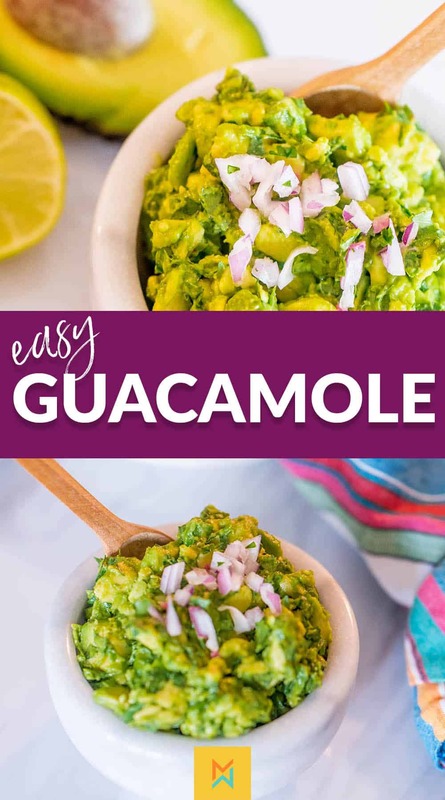 This easy guacamole recipe is so fast and delicious that you can make it in a pinch and most of the ingredients can be found in your home already. 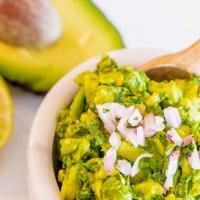 I love that you retain the rich avocado flavor, while still spicing it up just enough! Cut the avocados in half lengthwise and remove the stone. Scoop avocado away from the skin and into a bowl. If your avocados are firm, use a knife and roughly cut them in the bowl. If they are soft, mash with a fork. Stir in lime juice, spices, cilantro, and onions. I am born and raised in Southern Cali as well. Raised in a Mexican household and married into other Hispanic cuisines. I have NEVER heard of or been served guacamole with any kind of Chili poweder. Interesting. Thanks Gav. It’s one of our favorite quick snacks! Glad you liked it! Gave this a try at our latest gathering and it was a huge hit with everyone. Thank you. You can’t beat a great guacamole right? Always a crowd pleaser. Thanks for letting us know Katrina.